BTS's message for the world's youths that day, however, was less about vocation than inspiration and self-acceptance. The seven young men of the Korean pop group BTS stepped up to a single microphone Monday, looking familiar but not immediately placeable. They had traded in their flashier stage outfits for dark, fitted suits. And when the leader of the group opened his mouth, he spoke rather than sang. 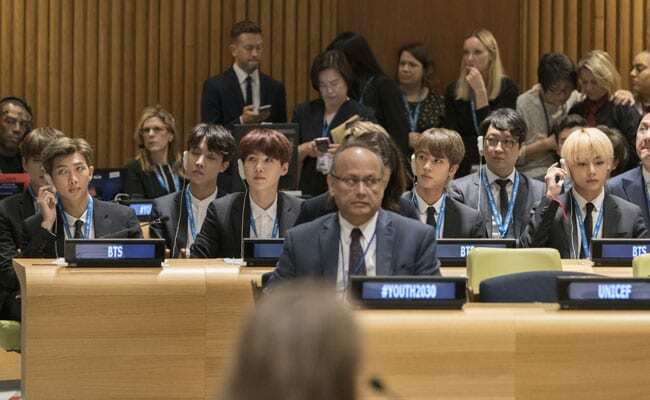 The blockbuster K-pop boy band was in New York this time not for one of their sold-out concerts but to speak at the United Nations' "Youth 2030" event to launch Generation Unlimited, a new U.N. initiative with UNICEF "that aims to ensure that every young person is in education, learning, training or employment by 2030." Kim Nam Joon - better known as BTS lead singer "RM" - opened by talking about his childhood in Ilsan, a city near Seoul that was idyllic, to hear him describe it. "It is a really beautiful place with a lake, hills and even an annual flower festival," RM said. "I spent a very happy childhood there and I was just an ordinary boy." His days were filled in with a fanciful imagination, including the thought that he was a "superhero who could save the world." When RM was 9 or 10 years old, however, self-doubt began to creep into his thoughts. "In an intro to one of our early albums, there is a line that says, 'My heart stopped when I was maybe 9 or 10.' Looking back, I think that's when I began to worry about what other people thought of me and started seeing myself through their eyes," RM said. "I stopped looking up at the night sky, the stars. I stopped daydreaming." He continued: "Instead, I tried to jam myself into the other molds that other people made. Soon, I began to shut out my own voice and started to listen to the voices of others. No one called out my name and neither did I. My heart stopped and my eyes closed shut. So, like this, I - we - all lost our names. We became like ghosts." Fortunately, RM continued, he found his "one sanctuary" in music. "There was a small voice inside of me that said, 'Wake up, man, and listen to yourself.' But it took me quite a long time to hear music calling my real name," he said. "Even after making the decision to join BTS, there were a lot of hurdles. Some people might not believe, but most people thought we were hopeless, and sometimes I just wanted to quit." The idea that BTS was ever a struggling group might be unthinkable to those who are familiar with their astronomical success. Formed in 2013, BTS is now K-pop's most successful group, selling out stadium shows where they are usually greeted with a frenzied energy not seen since Beatlemania. "It was one of the first K-pop acts to perform at the American Music Awards in November 2017. The group also made history as the first in the genre to take home an award at the 2017 Billboard Music Awards. [In May], BTS became the first Korean band to perform live at the 2018 Billboard Music Awards. "Now, BTS, the seven-member group also known as the Bangtan Boys, has made history again as the first K-pop band to have an album debut at No. 1 on the U.S. Billboard Top 200 chart. "Love Yourself: Tear," the group's third album, was released May 18 and in its first week had the equivalent of 135,000 sales in the United States, of which 100,000 were traditional album sales, according to Nielsen Music." RM acknowledged the group's success but said he was "still an ordinary 24-year-old guy." 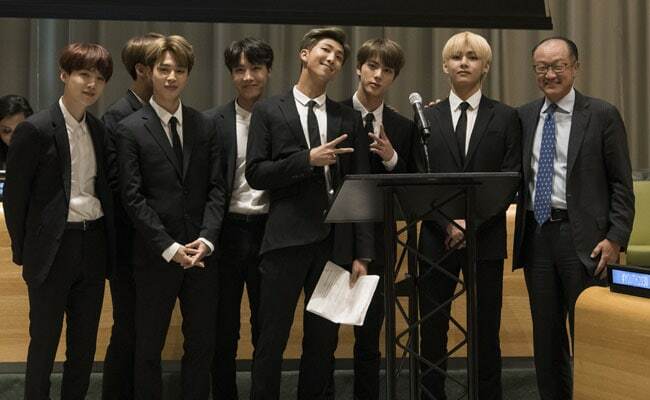 He credited their achievements to the support of his band mates and because of the love from their fan base, who have dubbed themselves the "ARMY." "Maybe I made a mistake yesterday, but yesterday's me is still me. Today I am who I am with all of my faults and my mistakes," he said. "I have come to love myself for who I am, who I was and for who I hope to become." It's certainly not the first time BTS has spoken out about the importance of loving oneself. The group has released several albums, videos and "creative projects" that have been part of its "Love Yourself" series. Last year, BTS partnered with UNICEF to launch a worldwide campaign called "Love Myself" with the same message. RM said they frequently hear from fans who tell them how the message helped them overcome hardships in life and start loving themselves. "Those stories constantly remind us of our responsibility. So let's all take one more step. We have learned to love ourselves, so I urge you to speak yourself," RM said. "No matter who you are, where you're from, your skin color or gender identity, speak yourself, find your name and find your voice by speaking yourself."